Have you ever heard that certain clothes make you feel powerful? Let's say a power suit, or maybe a red power tie for men? Well there are certain makeup looks that make me feel powerful - red lips in particular. Red is such a classic color choice, but it's also bold and brave at the same time. 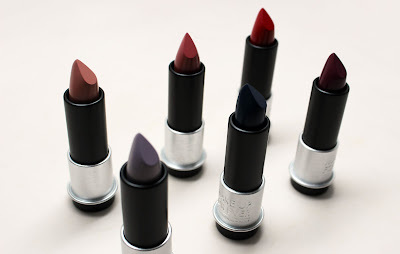 Lately, I've been obsessed with rocking Make Up For Ever new Artist Rouge lipsticks including my new favorite red lippy. Check it out! Yesterday I told you that I attended the Essence and Johnson and Johnson Path to Power event. I knew they would be taking photoshots and that there would be some pretty influential people in the room. Therefore, I put together a makeup look that was clean but powerful. I went for neutral metallics on my eyes using the Juvia's Place Nubian Palette. I'm also rocking House of Lashes Noir Fairy false lashes. These lashes alone make an impact. They really bring out my eyes without the need for lots of eyeshadow or color. Last but not least is the red lip. 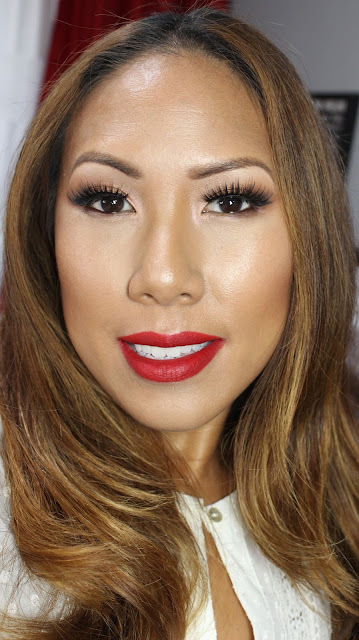 I'm rocking Make Up For Ever Artist Rouge matte lipstick in M401 Limited Edition Hot Red. It's the perfect classic red and makes my teeth look super white! It's matte, but not drying and very comfortable to wear. This lipstick lasted 6 hours through the event, wine and dinner. 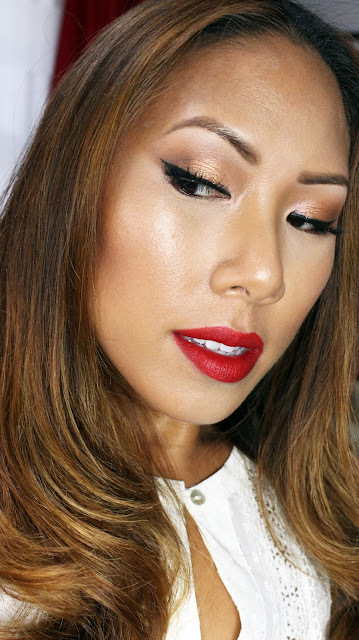 There are times when you need to count on certain makeup products to come through and the red lip is one of them. You can find this shade at Sephora or anywhere that retails Make Up For Ever. Do you have any makeup products that make you feel powerful? Leave your thoughts in the comments below!